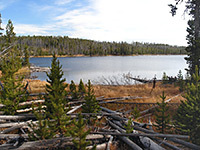 There are three small lakes along the upper stretches of the Gibbon River - Grebe, Wolf and Ice, of which the latter is much the easier to reach, being just a third of a mile from the main road, via a mostly level but comparatively little-used path through new growth lodgepole pine forest. 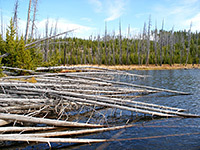 The lake is still far enough from the highway to be completely quiet and peaceful, and is a good location for a picnic, as well as being a fun place for children, who can play amongst the many fallen tree trunks - from pines killed by the 1988 wildfires that burnt 36% of all Yellowstone's forests. Wildlife that may be spotted in the area include moose, cranes and blue herons, though not fish, as the lake lacks the flowing water which is a requirement for most species. Start point for the Ice Lake hike is at a small layby along the Norris-Canyon road - 3.5 miles east of Norris Geyser Basin, and nearly opposite the far end of the one-way side road past Virginia Cascade. The path heads north perpendicular to the road up a gentle incline through the forest, which was almost totally destroyed by fire in 1988 - just a few original trees survive, rising above a thick green carpet of new trees about ten to 15 feet tall. 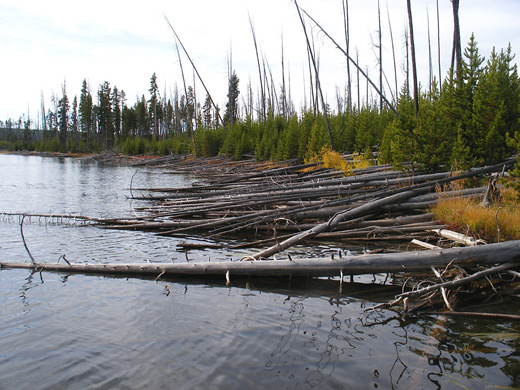 Most of the dead, burnt trunks of the old pines have fallen, creating a lattice across the ground with logs stacked six or more high, and forming a sturdy supportive structure for the new growth. As the lake approaches, a spur path leads to a primitive campsite (4D3), one of the closest to the road anywhere in the park, and just a few steps from the lakeshore. 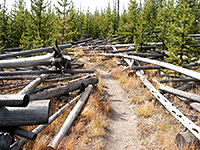 The main trail, now quite level, follows the short west side of the lake on to a junction with the Howard Eaton Trail; the left branch reaches the Grand Loop Road a little way north of Norris after 4.3 miles, while the right fork is to Wolf Lake (3.5 miles), Grebe Lake (4.7 miles) and Cascade Lake (7.1 miles). One option for a loop hike is to take the right branch along the north shore of Ice Lake to a second intersection, with the Wolf Lake Trail, then use this route to return to the highway. A small meadow covers the marshy land around the Howard Eaton junction, though most of the water's edge is densely forested, and the lake is small and not particularly noteworthy apart from the many fallen pine trunks lying along the shore, radiating outwards - some are sufficiently rigid to allow a person to walk along, 30 feet or more out over the water.